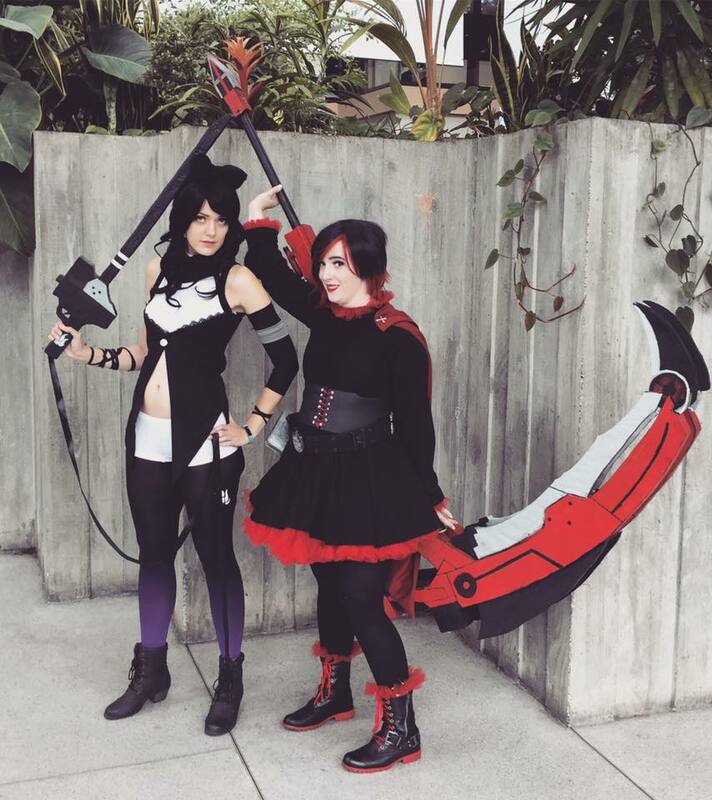 PAX West 2016 Wrap Up! - Hello, Kristina! 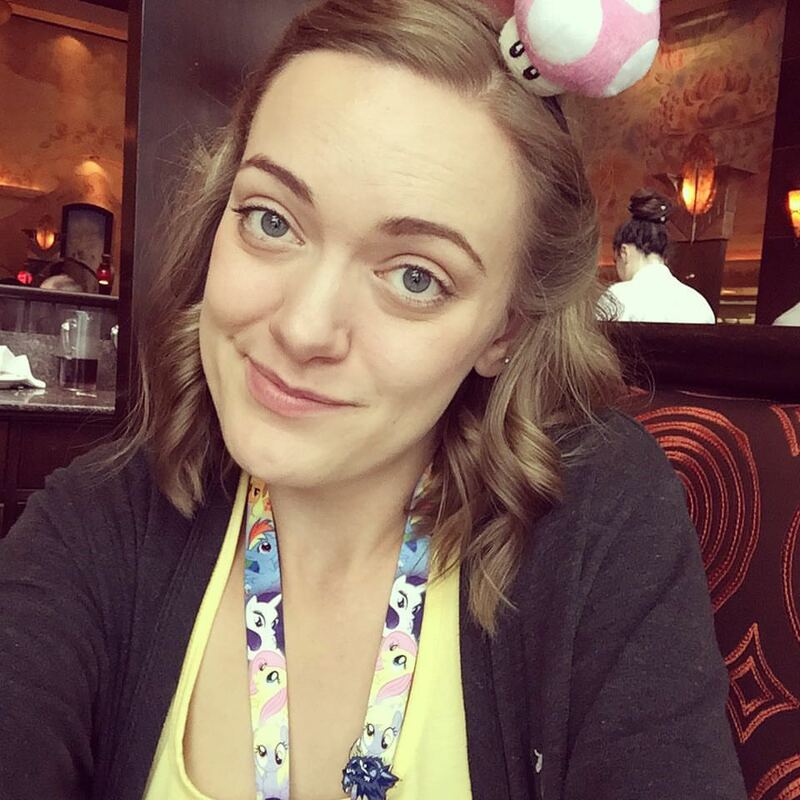 PAX West 2016 Wrap Up! Hey everyone! Last weekend was PAX West here in Seattle, and while I am totally and completely exhausted, I have decided I need to do a better job of documenting the stuff I’m doing. So here’s a comprehensive overview of the highlights of this awesome gaming convention. Cosplay is always a big part of my conventions, and PAX is no exception. I had actually planned to wear costumes every day (it’s a four day convention so I had FOUR different costumes ready) but I only managed to make 3 happen. I seem to forget each time how much energy costume-wearing really takes. Uncomfortable shoes, pin curls and wigs, carrying around props, stopping for pictures… these are all things I love, but I’ve learned that 4 days of anything just starts to feel like how your life is now, so after 3 days of this – I needed a break. The picture above is the very comfortable outfit I opted for on Monday. That being said, here’s what I wore on Friday-Sunday! SATURDAY: This was one of the best cosplay days I’ve ever had. The three of us fell in love with this as a cosplay idea last year at GeekGirlCon when we met the artist (Skirtzzz) in artist’s alley. 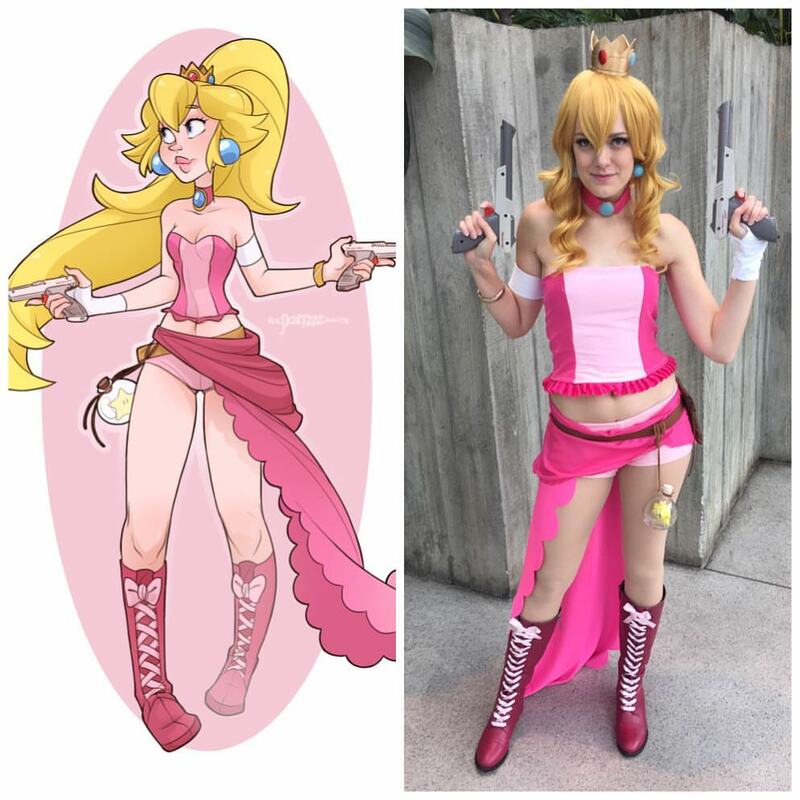 I’ve always loved Princess Peach but I am not the biggest fan of her basic iconic dress, so seeing such a fun alternative outfit for her instantly grabbed my attention. Luckily Eia and Jenn also loved the outfits, and we vowed to make them for PAX, this year. And we did. People at PAX really seemed to like the costumes, even if they didn’t totally get them. They’re a stretch, believe be. 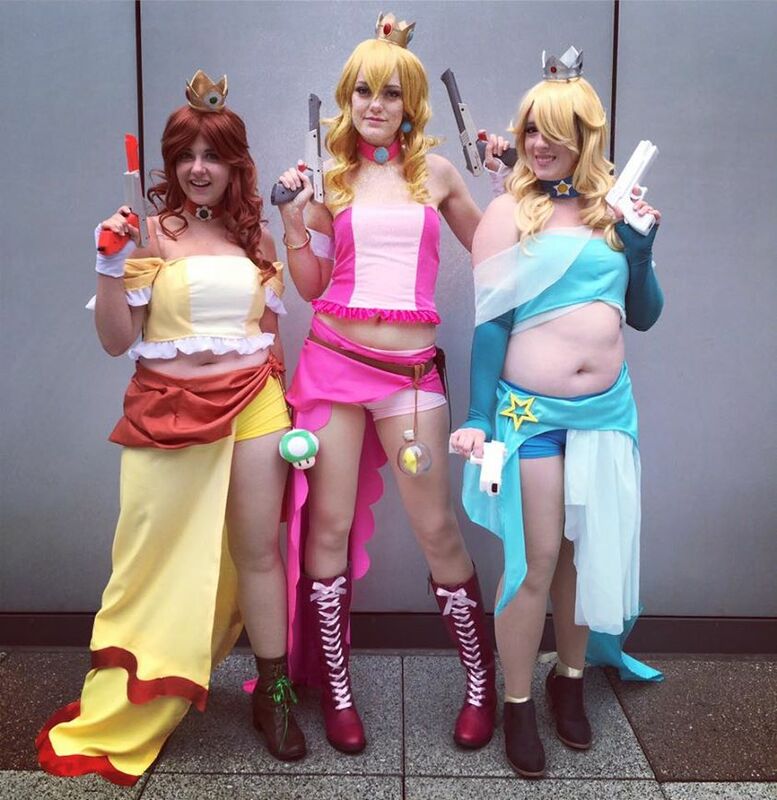 The concept is Mario Princesses wearing FFX-2 dress spheres, in the style of the gunners. I haven’t actually played FFX-2, so I had to have someone explain this to me, but I was relieved when a number of people referred to it as “isn’t that the dress up game?” I’ll take it. Here’s a side by side reference of the costume I was recreating. 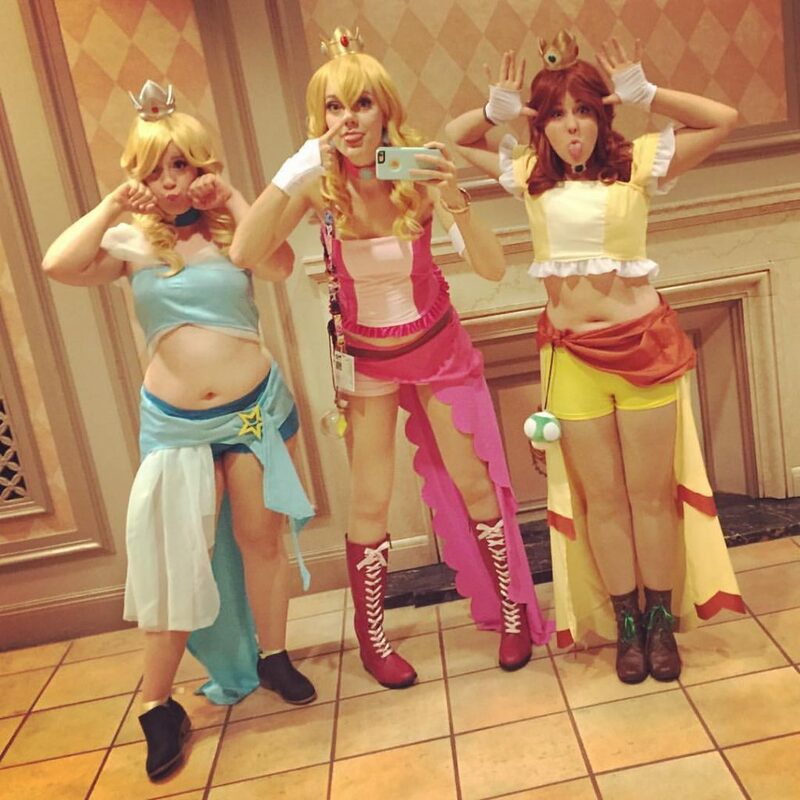 I this this is my favorite costume group we’ve done yet, and personally – I cant wait to see what new art Skirtzzz brings to GeekGirlCon this year! Maybe we’ll be inspired again! 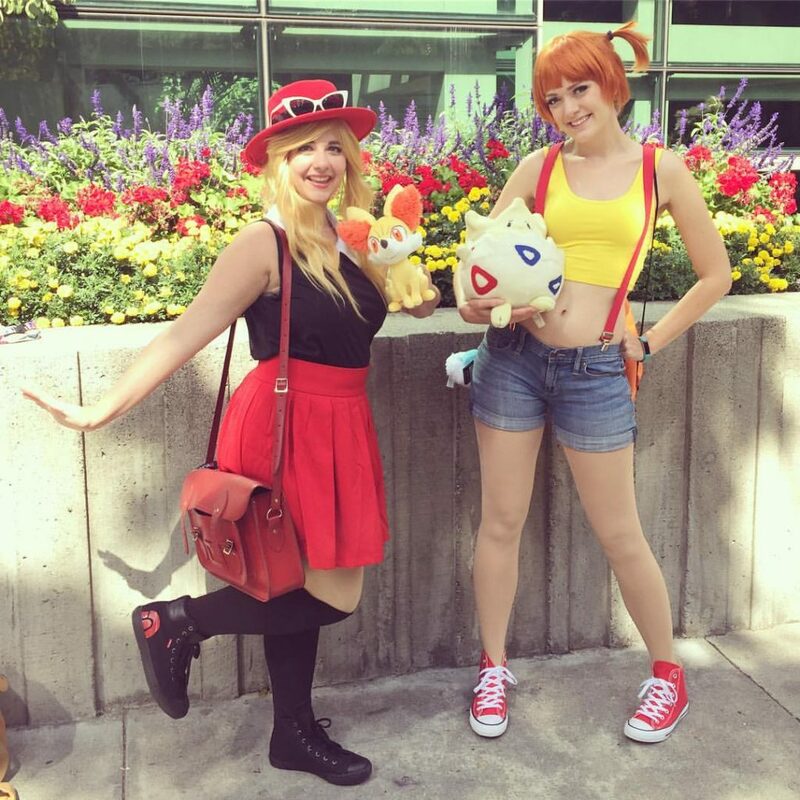 SUNDAY: Maybe it was the Pokemon Go craze this summer, but I was finally, finally motivated to do the Misty cosplay I’ve always dreamed of. I have literally had this Togepi plushie sitting on my shelf for years. 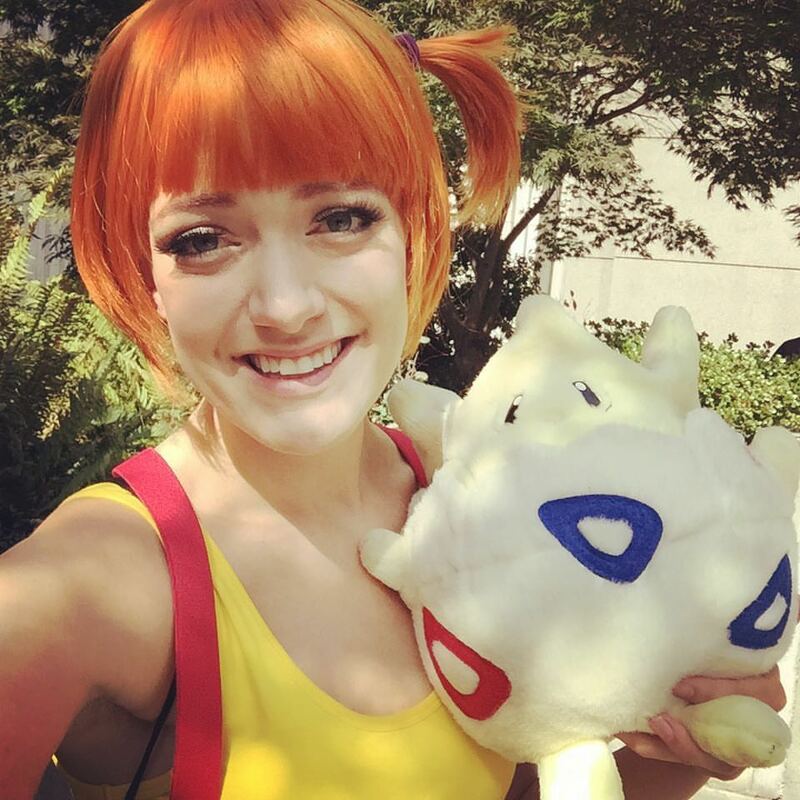 Funny story – a fan from Germany actually sent me this Togepi because he thought I might need it if I ever dressed up as Misty. Amazing – and he was right! Eia was in the Pokemon spirit as well, and since we ran out of Indigo League to watch while we were making our costumes and recently started XY, she decided making a Serena costume would be the perfect thing for her Sunday outfit. We had fun representing the old and new of one of our favorite franchises, and Pokemon XY is surprisingly fun. I do miss the old voice actors, though. We played a LOT of games at PAX. I mean naturally, since that’s what the convention is all about, but I am actually very impressed with how many games we fit in despite how much time cosplaying tends to eat up at cons. Firewatch: First person mystery adventure game that looks like a lot of fun. Played a demo and liked it so much I bought their adorable camp-themed logo tank top. Grimm Ecplise: RWBY game. 4 player online co-op hack-n-slash. I’m not usually into these types of games, but getting to play as Blake really sold it for me. Complicated Board Game The Card Game: This game was hilarious. It’s a card game about playing complicated board games. It’s like a combination of Fluxx and Munchkin. To be fair, I don’t actually like either Fluxx or Munchkin all that much, but we had a great demo-er and we had a pretty good time with this one. If you don’t like Fluxx though, proceed with caution, because it’s definitely a constant rules-changing card game. JunKing: Another card game, and probably my favorite one from the Indie Mega Booth. You play as a… garbage imp? And you basically rifle through the trash to collect prestigious items to raise your status with your garbage tribe. I think you’re essentially a raccoon. I don’t know. It was fun. Star Realms: This game was by no means new, and Joe and I actually already owned a copy, but my friends and I spent a good deal of time at the Star Realms booth – and now I think I have everyone hooked. It’s a great game because it plays 2, but if you combine two decks, it can play up to 4. Great versatility in a game! It’s a competitive deck builder set in space and now that we have all the expansions and whatnot, I imagine we’ll be playing this a lot more. Captain Sonar: We happened upon this game by chance in a tabletop free-play room. It’s an 8 player game (four on four) and it’s like if you added a ton of skill and strategy to ‘Battleship’. Very stressful, very fast paced, and a lot of fun. Costa Rica: This was a cute little game Eia and Jenn and I stumbled upon, and we had a great time playing it. It’s like if you mixed ‘Hey That’s My Fish!’ (hex piece puzzle game) with ‘Zombie Dice’ or ‘Pass The Pigs’ chance-taking gambling game. It was a fun mix of the two, and collecting cute animals from the rainforest was a plus. I had the pleasure of getting to play a demo of the new Thornwatch by none other than one of the creators himself, Rodney Thompson. 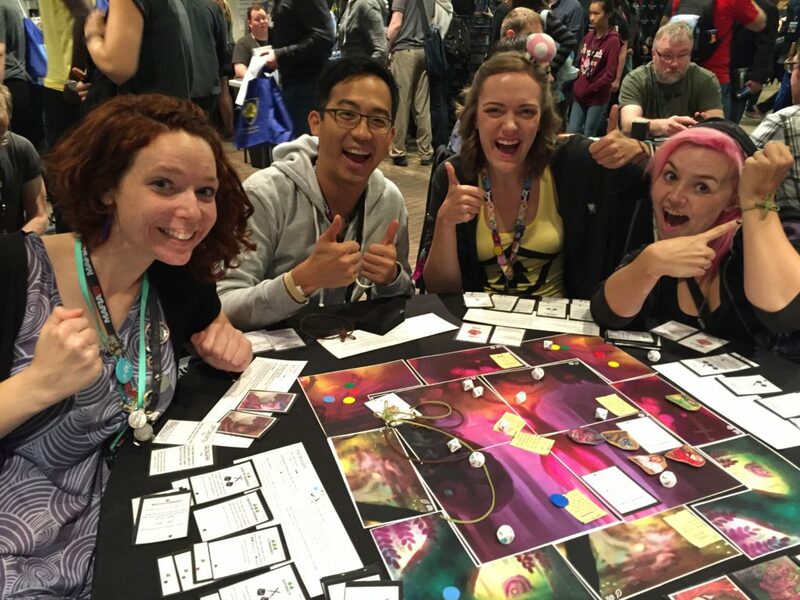 Plus, the other players in my demo were Jimmy Wong, Kiri Callaghan and Lauren Bond – fellow creators I know and love dearly! All in all it was an ideal situation for getting to check out an awesome new game, and a big thanks is due to my friend Tara of the GeekyHostess, who set the whole thing up. Thornwatch is described as a “graphic novel adventure” and it’s made by Lone Shark Games and Penny Arcade themselves. It played liked a game somewhere between a longer form RPG and a sit-down-and-play board game, which is my favorite kind of game. The coolest part was that so many elements of the game changed depending on which campaign you played – from the pieces of the board used, to which monsters you fought, to actual in game elements like protecting villagers or stopping the enemy from making matches of tokens needed for them to win. Replayability is such an important feature in a game, especially when they are an expensive as full games can be! Thornwatch seems like it can change over and over again, and I seriously look forward to owning this, when it’s out. If Thornwatch sounds like something you’d like, it has a live Kickstarter running right now, which ends on Oct 5. Joe and I already backed for our copy! PAX was such an awesome time. Getting to run around in costumes, play games with my friends, and take two days off work is an ideal way to spend a weekend, and I can’t wait until next year. 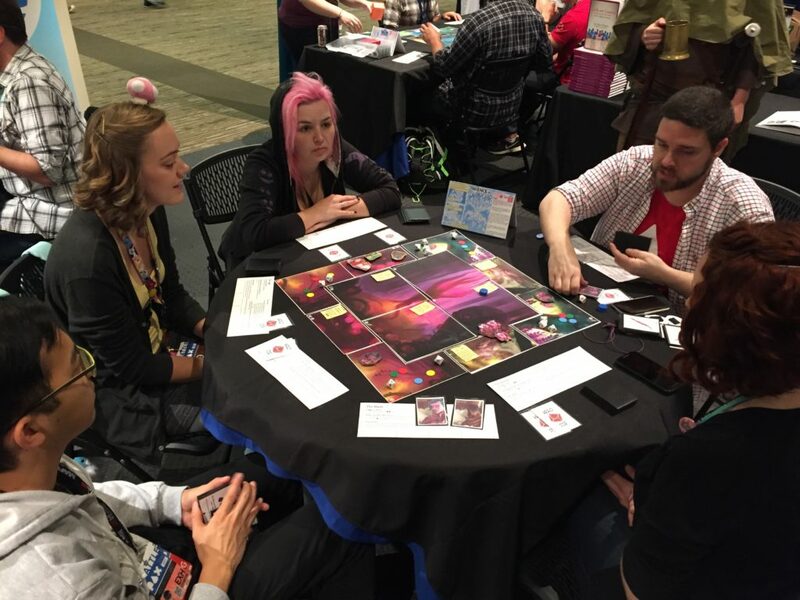 Were you at PAX, or have you ever been to a game-centric convention? Tell me about it in the comments! BEA 15 Haul + Video Diary! 2015 Conventions I Will Be At! Where I’ll be at Emerald City Comic Con ’15! Happy Halloween! NaNoWriMo is tomorrow! I’m definitely going to check out the games you mentioned. I just got home from playing two new games. The first was called Spyfall (fast and a great game to play when you aren’t in the mood for a rule heavy game) and Above and Below. This one had a lot of rules and pieces to keep track of but was pretty fun. Glad you had such a fun time! I’ll check out those two as well! Thanks! First thing: loved the cosplays! Second thing: love the new site design!!! It’s so cheerful and was such a nice surprise to open up to. Third thing: I love it when you do blog posts. Always makes my day. This was the sweetest comment… thank you!